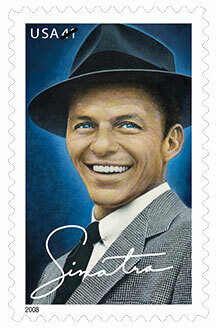 The 2008 Frank Sinatra commemorative stamp. Frank Sinatra is the ultimate core artist for any adult-targeted station and he still gains new fans every year. Now you can put him on your station in a dynamic and fresh approach to the greatest entertainer of the 20th century. Listen to a full show below and hear the potential! Swingin' with Sinatra is a music lover's treat. This 2-hour weekly radio show features Frank Sinatra's music, with biographical notes, interviews and many rare and exclusive clips from network radio shows, movies and vintage news reports. The music is as always unpredictable and pleasantly surprising, coming from Sinatra’s vast repertoire and long career. Songs from other artists make an interesting and stimulating mix, including Bobby Darrin, Ella Fitzgerald, Nancy Sinatra, Dean Martin, Buddy Greco, Sammy Davis Jr. and the others from the Rat Pack. The show is presented by Steve Jaxon Vicario, a lifelong Sinatra fan and who uses his vast collection of Sinatra audio bits in every show. -G. Zlot, GM, KJZY, Santa Rosa, CA. Hour 1 Seg. 1: Music from Come Swing with Me (1959), plus Bobby Darrin, Buddy Greco, Frank live in Vegas. From the TV Special: Opening "Sounds of the City" montage, Day In Day Out, monologue, Get Me To The Church On Time, Old Man River; HOST BREAK; Bewitched, Bothered & Bewildered with Patti Labelle, The Best Is Yet To Come with Jon Secada, A Foggy Day with Willie Nelson, Embraceable You with Lena Horne. Hour 2 Seg. 1: Songs with Billy May Orch. & Gordon Jenkins Orch. Radio Clip from The Command Performance Show: Bob Hope and Judy Garland introduce Frank Sinatra, who sings All The Things You Are. Guys And Dolls, with Dean Martin, I’ve Got You Under My Skin, Nelson Riddle Orch. ; HOST BREAK; Isle of Capri, Road to Mandalay. Contact us for more information about getting any of our shows on your radio station or network.